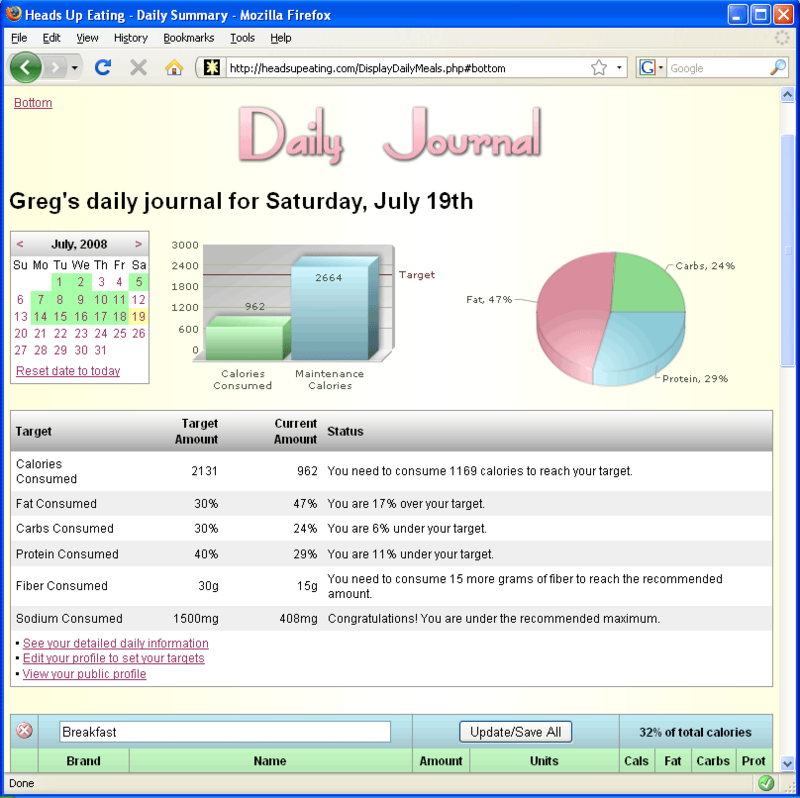 When you first log into StayCut.com, you will be presented with the main Daily Journal page. You may also get to this screen by clicking Home at the top or bottom of any page. The day will be set to the current date for your location by default, but you may change the date using the calendar to enter or view meals and foods for any day. When you scroll to the bottom of the page, you will see that no meals for this day have been entered yet. I will add one here called "Breakfast" by typing in the name of the meal in the dialog box shown and hitting Enter or clicking Add Meal. This is will add a new blank meal to your day, as shown. The next thing you need to do is add the foods that you ate, or will eat during this meal. I will click on Add a food to this meal to do so. This will bring up the Add a Food page. 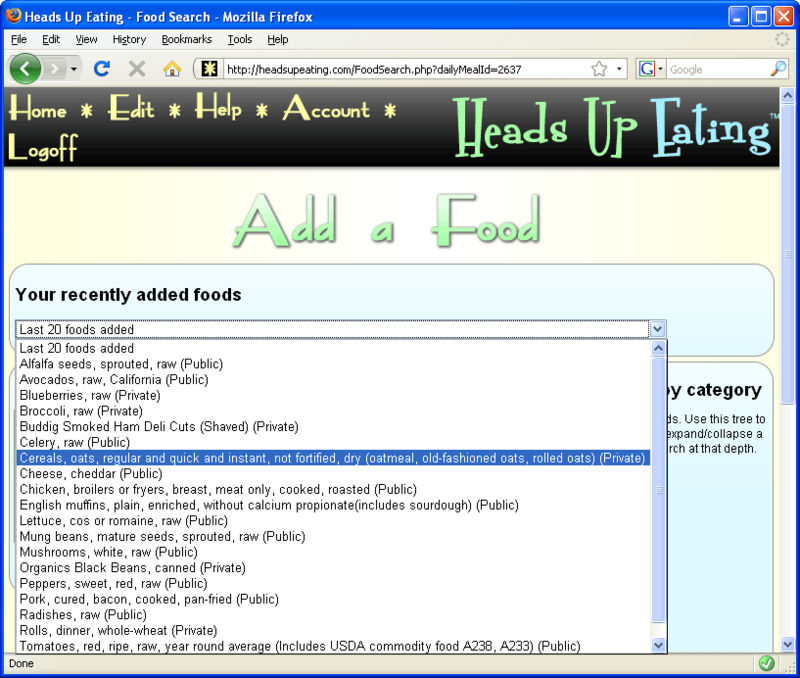 From here, there are several options for finding and adding foods. In this case, I want to add raw blueberries to my meal, so I will search the database by typing "blueberries" in the Name field, and hitting Enter or clicking Search. For details into how to optimize your searches, see my blog entry. This will bring up the search results found for "blueberries". Search results are color coded by the food type. 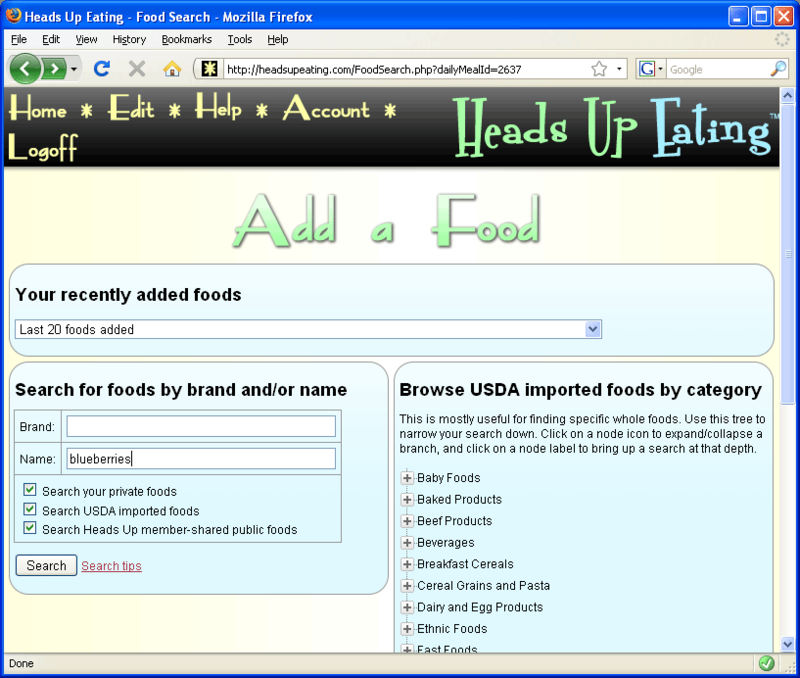 In StayCut.com, there are 3 types of foods: private, public, and USDA imported (a subset of public). Each is denoted in the search screen with red, blue, or yellow colors, respectively. See this section of the FAQ for the difference between private and public foods. Once you find your food, you may either click the green + icon to add it directly to your meal, or you may click the brand or name label to bring up details of that food, experiment with different amounts, and then add it to your meal if you want. In this case I found I have a private food for "blueberries, raw", and I will click the name to bring up more details. 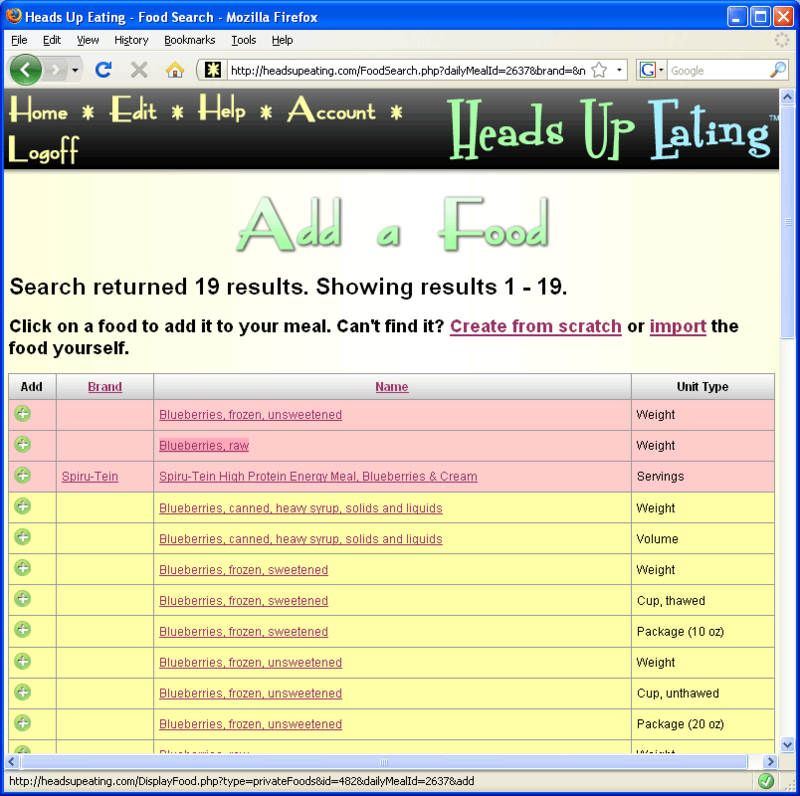 This brings up the Food Details page. 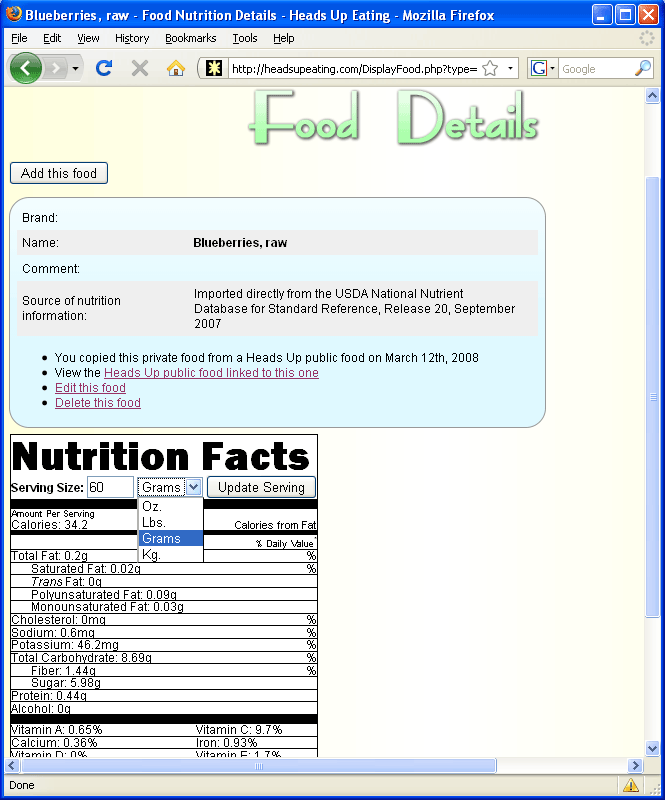 As you can see, the nutrition information for the food is shown, and you can adjust the serving size and units to whatever you want and see updated info. 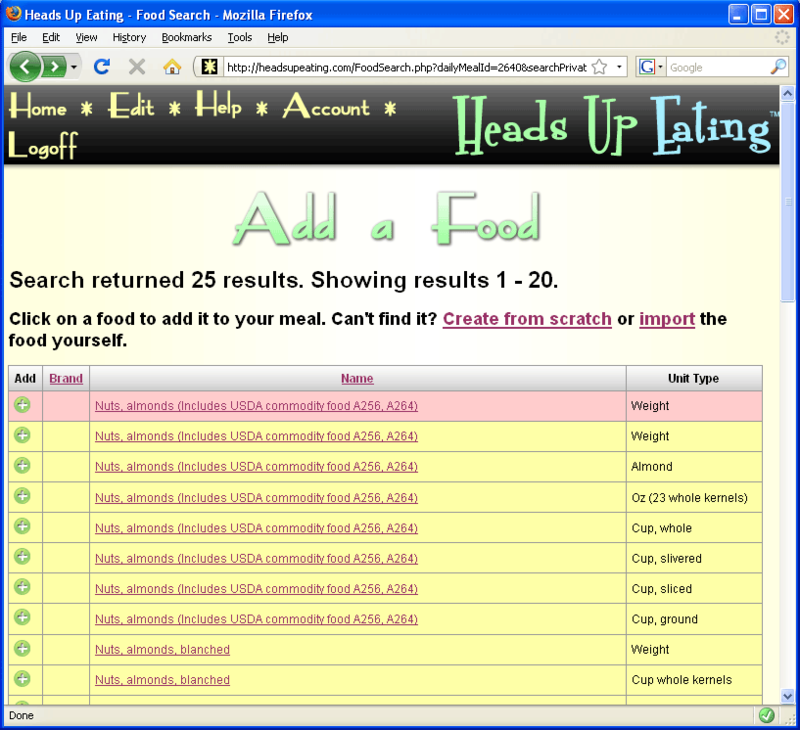 I will change the serving size to 160 grams and hit Enter or click Add this food to add the food to my meal. As you can see, the blueberries have now been added to my meal, and the basic nutrition information for my meal so far is shown. I want to add another food, so I will click the Add a food to this meal link. 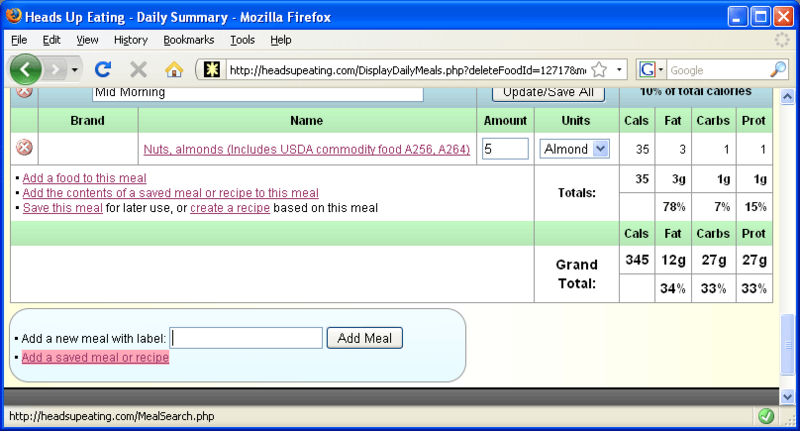 I want to add oatmeal to my meal, and since I remember adding this food recently, I will use the recently added foods dialog box. Sure enough, I find my oatmeal on the list and click it. The oatmeal will immediately be added to my meal with the serving size and units I last used, and I will be taken back to the main Daily Journal page. 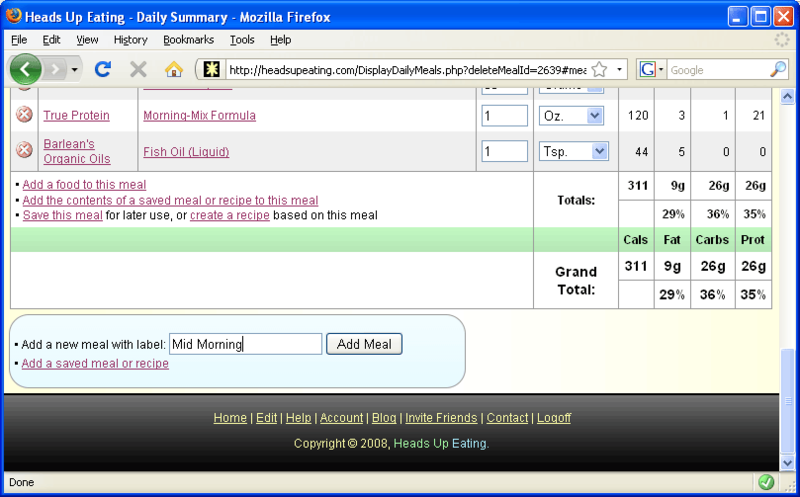 I will add two more foods to this meal in a similar fashion, by clicking on the Add a food to this meal link and either searching or using the most recently added foods feature. As you can see, the macronutritients for my meal are shown, along with their ratios to each other. 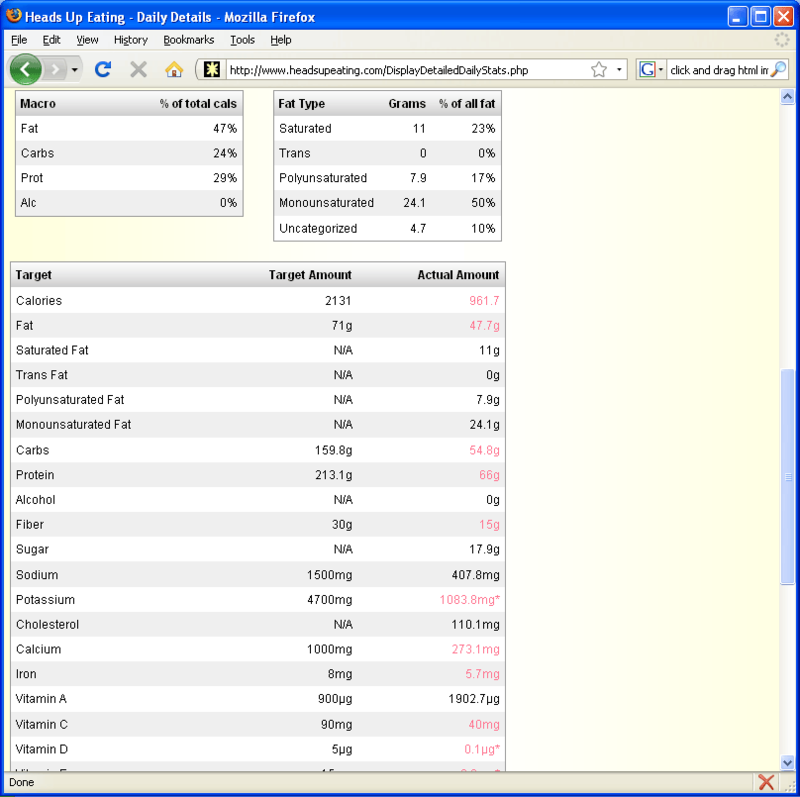 In addition to showing your total nutrition for the day, StayCut.com also breaks everything down by meal, which will help you fine tune your diet. I am finished adding foods to my breakfast. Now I want to add my next meal of the day, my Mid Morning meal. 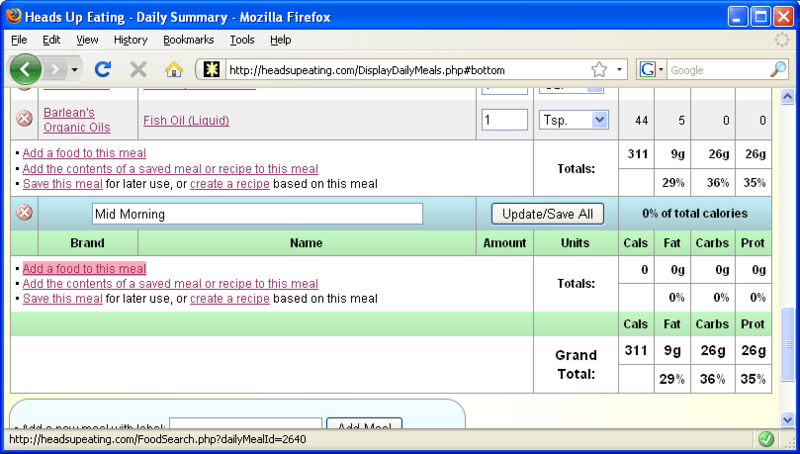 I will scroll to the bottom of the page, type the name of the meal in the dialog box, and hit Enter. My mid morning meal is displayed below my breakfast, and now all I have to do is add foods to it. Here I will show you an alternative way to find foods: the food tree. This is useful for finding whole foods by category. Sometimes this is easier than searching by keyword. Click on the + node icons to expand out that branch of the tree. When you think you've found the right branch, click the label and all the foods under that branch will be displayed. Here I want to add raw almonds so I just click on "almonds" in the tree. This actually brings up a special kind of search that is restricted to foods in that branch. 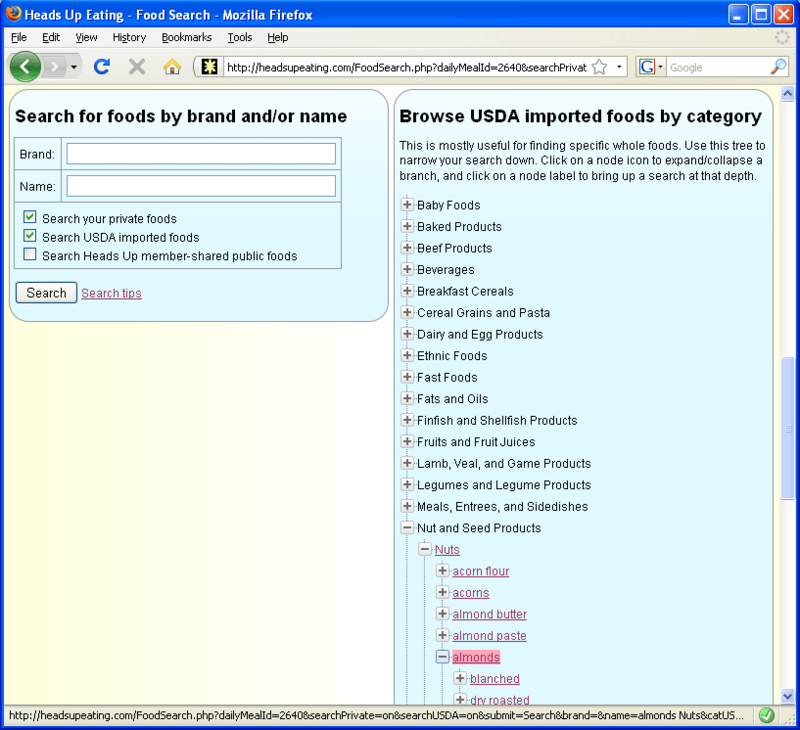 Notice "Nuts, almonds" shows up as one of my private foods, as well as a USDA imported food. 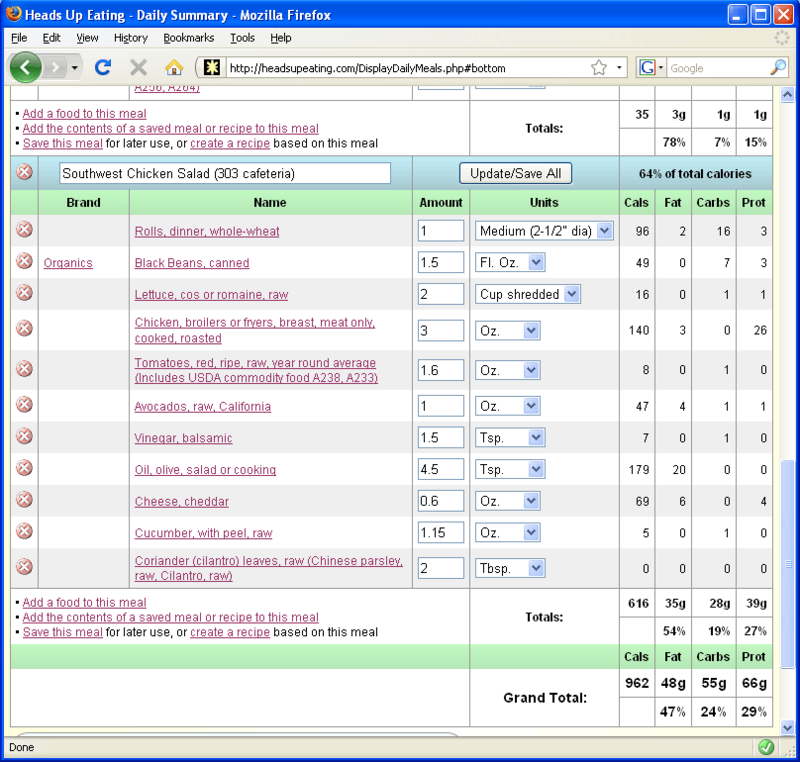 Given the choice, you usually want to add the private food, since StayCut.com remembers the serving size and units you used the last time you added the food, often saving you time. As you can see, both meals I've added so far are displayed, with their respective macronutrient values, as well as the percentage of calories they've each contributed towards my daily total thus far. 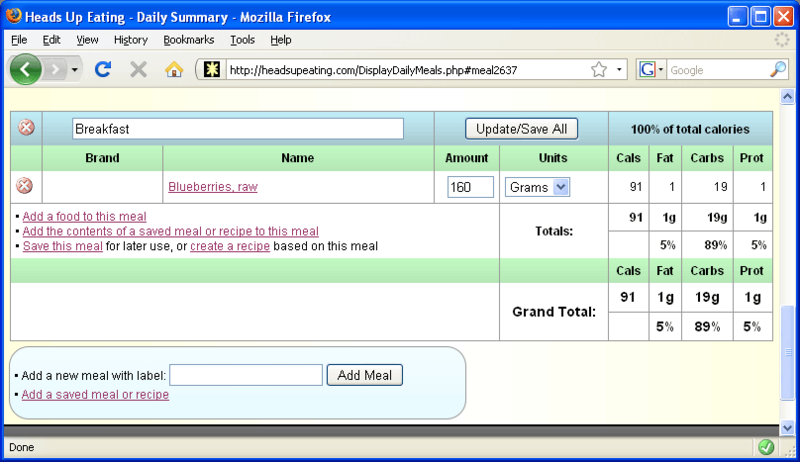 Next I will show you the powerful saved meals feature. 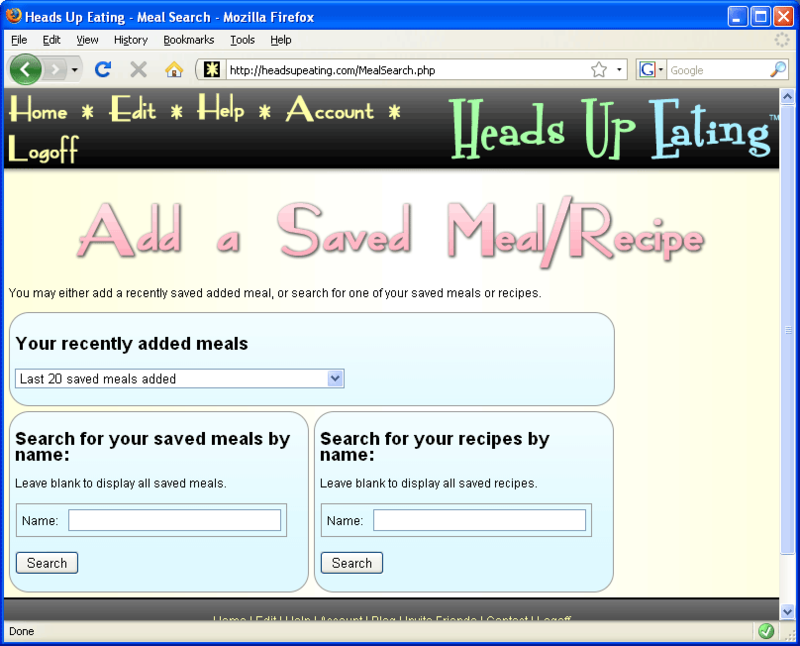 Any meal you create you may save for later use by clicking the Save this meal link. 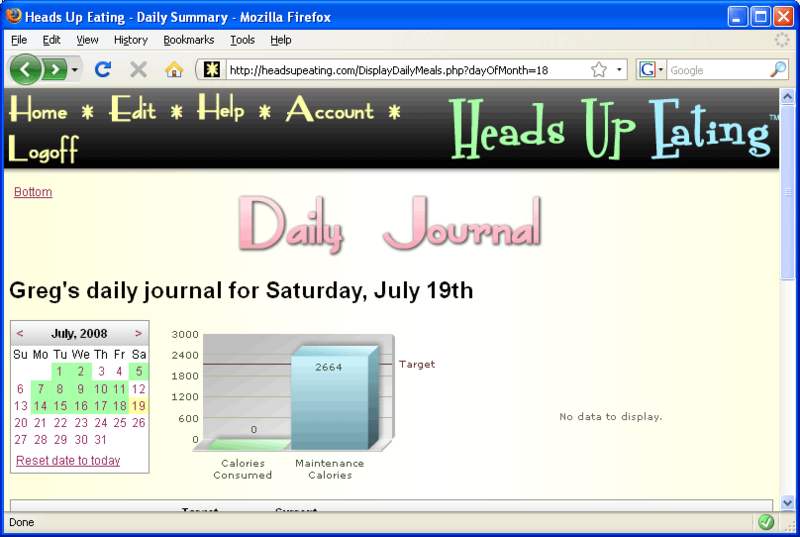 I already have some meals saved, so I will add one to this day's journal entry by clicking the Add a saved meal or recipe link in the dialog box at the bottom of the page. This will bring up the Add a Saved Meal/Recipe page. 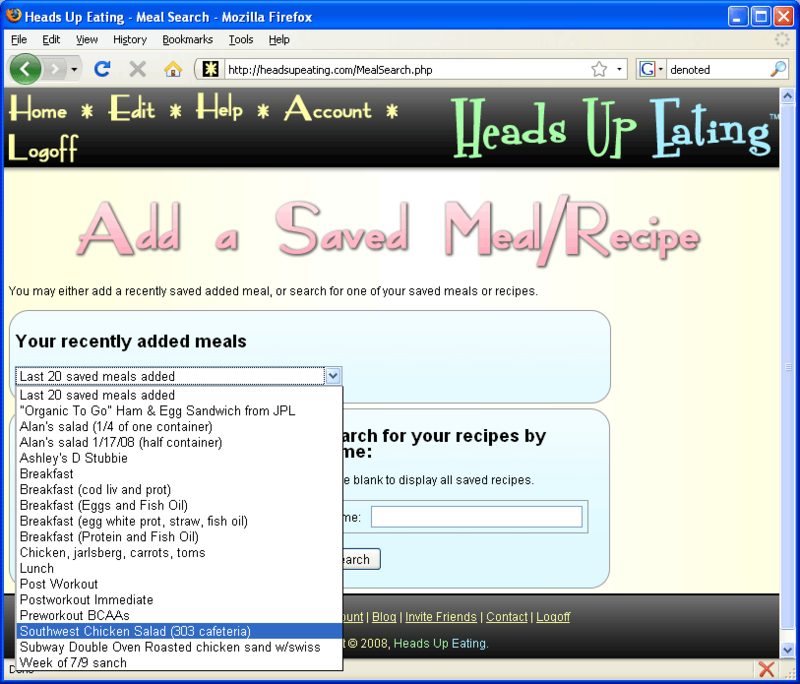 From here several options for adding saved meals and recipes are available, similar to the Add a Food page. I want to add the southwest chicken salad I get at work all the time. 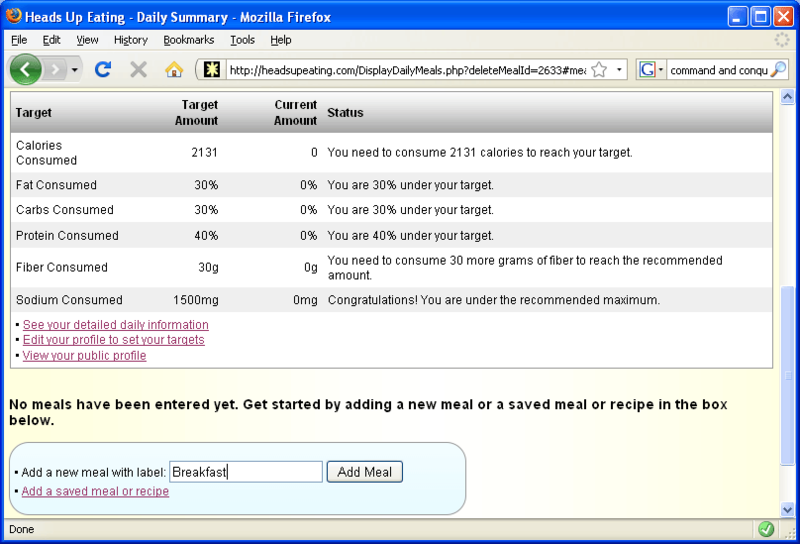 Since I know I've recently added this, I will use the recently add meals dialog box. I will click on "Southwest Chicken Salad (303 cafeteria)", which will immediately add this meal to my journal, and will return me to the main Daily Journal page. 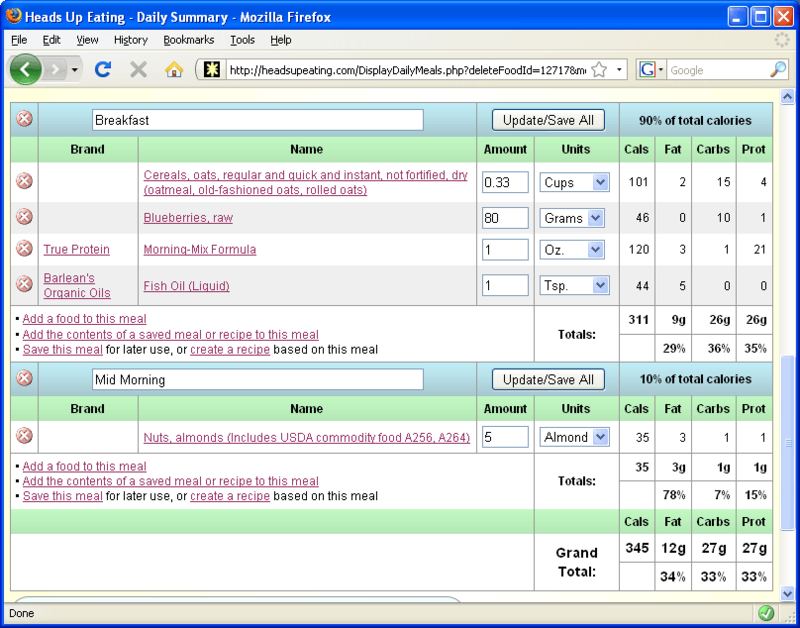 As you can see, my saved meal was added to my journal, with all the foods it contains and their correct amounts. 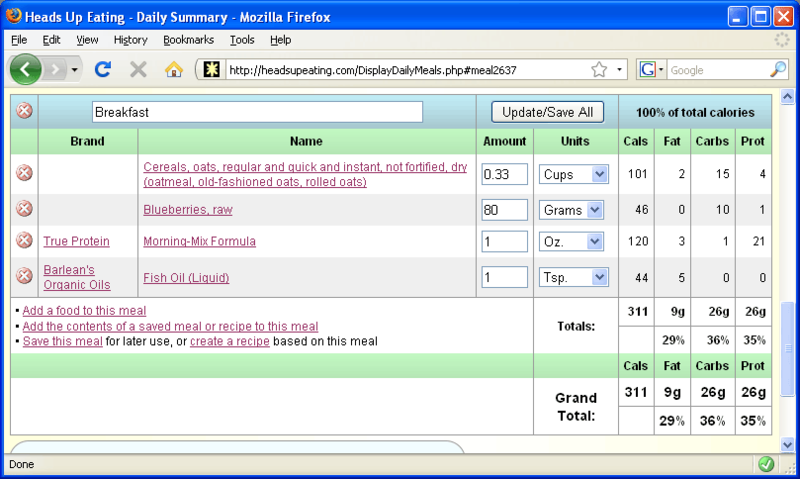 You can always adjust the amounts of any foods in the meal, as well as delete any or add more. If I scroll to the top of the page, I can see some information about what I've eaten (or plan to eat). I can see how close I am to my target amounts that I set for myself, and can adjust my remaining meals for the day accordingly. Here I'm about half way through my day, and I'm about half way through my calories, so that's good. I workout towards the end of the day, so I tend to eat more around my workout time. As you can see, I'm also pretty high in fat compared to my target. However, the meals around my workout time are often very low in fat, so I know that my fat percentage will go way down towards the end of the day--I'm looking okay there as well. One thing I definitely need to add more of at this point is protein. This is something I may or may not be able to adjust for by the end of my day, but at least this gives me a good indicator that I probably need to be eating more protein the first half of my day, so in the future I can be aware of this. My fiber intake looks great so far, as well as my sodium level. 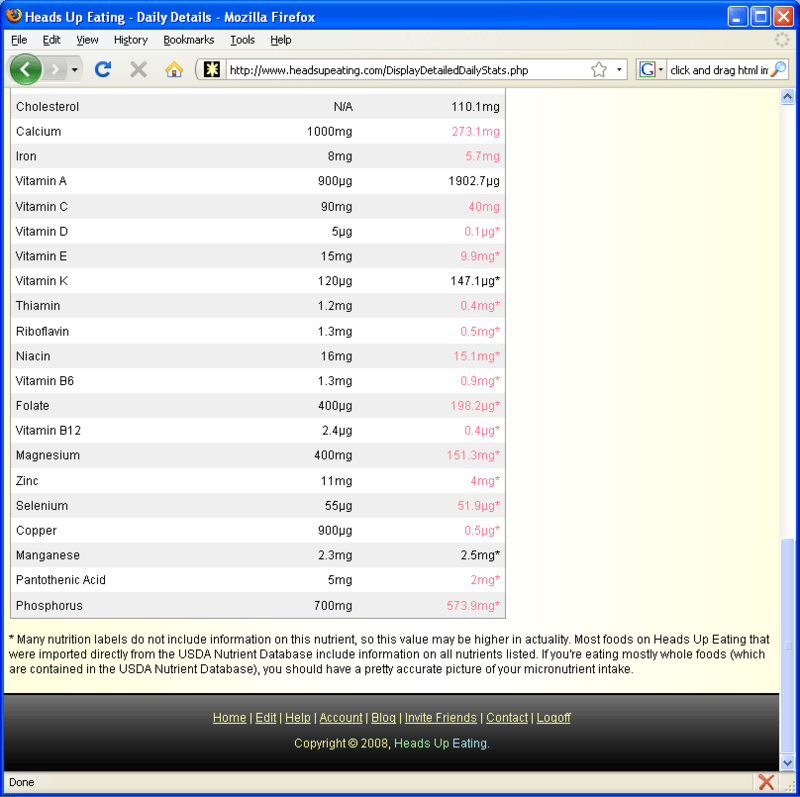 If you want to see all the details of your nutritional information for the day, you may click on See your detailed daily information. This takes you to the Daily Details page. 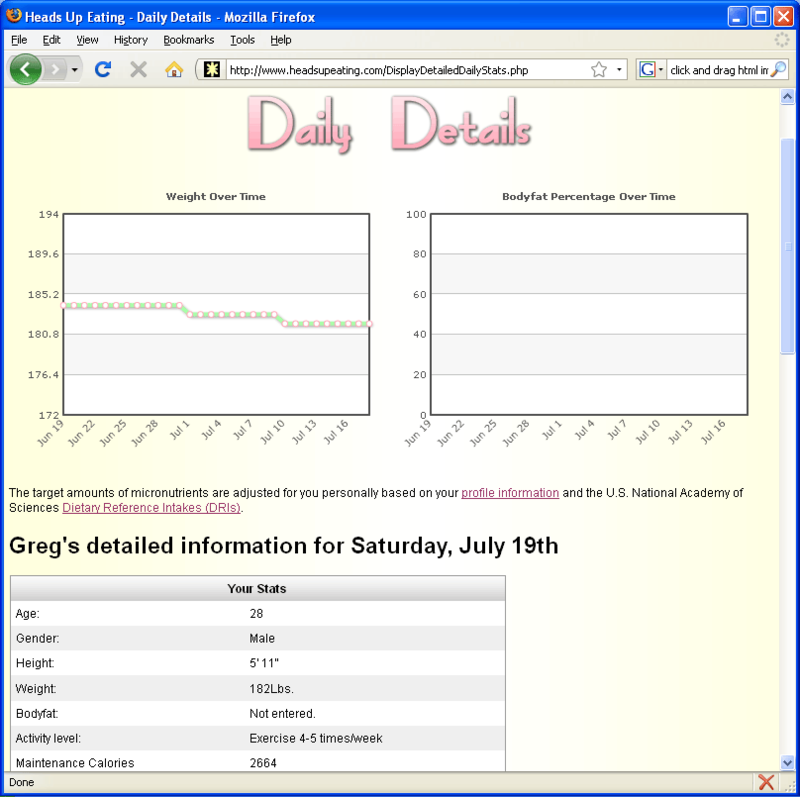 In addition to your detailed nutrition information for the day, weight and bodyfat trends are also shown. In my case, I don't know my exact bodyfat percentage, so this chart is empty for me. If you happen to know yours, you may track it over time in StayCut.com (your daily nutrition needs will also be calculated slightly more accurately as well). Nutrients for which I am not meeting my target or am deficient in are highlighted in red.